I’ve been busy with life. I’ve also been busy getting the house ready for a visit from Cindi. She’s arriving sometime tomorrow but will fly to South Carolina on Friday to spend the day with a new client. Until something exciting happens, enjoy these flowers. 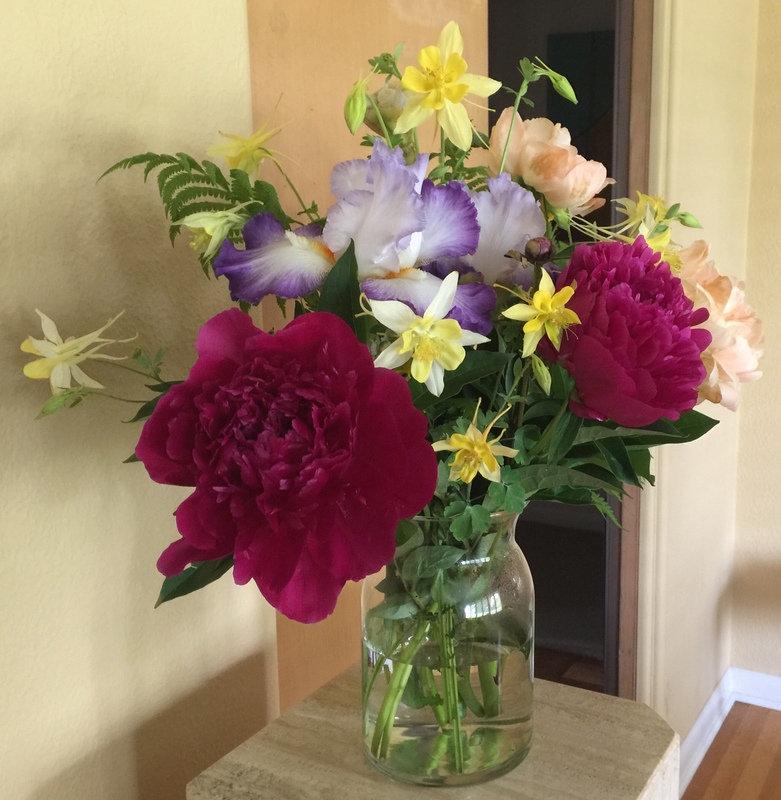 My neighbor, Sheila, dropped off the arrangement after I helped her move a sofa. Morgan is a guy I met at the gym. He’s late sixties. He’s been in an open relationship for fifteen years with Kenny, who is a few years younger than Morgan. It’s been interesting hanging out with these guys and their friends. Many of their friends are also in open relationships. Morgan and Kenny openly discuss their encounters with other men. Both are free to do as they please. There appears to be no jealousy or conflicts caused by their hook ups. Morgan has decided it’s his mission in life to introduce me to as many potential mates as possible. He’s invited me to happy hours and parties. I have yet to meet a guy I’d like to see on a regular basis. The last potential mate sounded promising at first. There were a lot of common interests. He was a few years younger than me. He was a nice looking man who was in shape. The only issue was he’s suffering financially. I don’t know why he’s in financial distress, but he can’t afford a $900 a month apartment and has to move to a rented room in a house in the suburbs. I declined to meet the man. I may have passed on a nice guy but I don’t want support a man. I don’t want to have to always pick up the tab. I’ve saved for my retirement, I didn’t save for a partner’s retirement. My ex and I maintained separate retirement accounts. For most of our relationship, we were financial equals. We didn’t need each other’s financial resources. We equally shared the cost of supporting the household. The thought of having a financially strapped boyfriend is not appealing. I don’t want to be taken care of, and I don’t want to take care of a partner. I may miss out on some good guys, but one has to question their character if they don’t have their financial house in order. I’ve been asked to pick up more responsibilities at work from the Merges & Acquisitions (M&A) team. A peer who supports this team has taken a leave of absence to deal with a family emergency. I do some M&A work but it’s not my primary focus. It’s a great opportunity to pick up new skills. My peer’s twenty something son has been diagnosed with Cannabis Induced Psychosis (CIP). I’d never heard of CIP but a quick Google search revealed it’s on the rise because of the prevalence of legalized marijuana. My peer’s son was taken to emergency room because he was disoriented and paranoid. The treating physician called in a psychiatrist for consultation because they thought the kid was schizophrenic. The kid agreed to a 72 hour stay in the psychiatric ward. The diagnosis is now CIP. My peer told me that young adults seem to be the most common group being diagnosed with CIP and that CIP could be a predictor for schizophrenia or bipolar disorder. My conversation with my peer was alarming. I smoked a lot of pot in my early years, as did most of my friends. I now many people who regularly enjoy legal marijuana. No one I know has ended up in the ER. I wonder if the increased strength of cultivated cannabis is contributing to the rise of CIP. Whatever the case, it’s a disconcerting trend. Mike texted last night asking me to meet him at Trade for gear night. I agreed to meet as it was just me and Netflix home alone again. Thirty minutes later we were at Trade. Kit soon joined us, followed a few minutes later by Garrett and Neil, who had been watching a drag show across the street at Gladys. It had been ages since the five of us had been together. Kit had spent most of the winter at his second home in Palm Spring overseeing renovations and bedding a Lufthansa flight attendant. Mike’s still in relationship limbo. Garrett and Neil are raking in the cash with the hot local real estate market. Neil is in the final stages of closing a huge deal and has been shopping for new rolls in anticipation of a seven-figure payday. It wouldn’t be my choice but Neil likes to be flashy. A drag contingent from across the street soon invaded the bar. They resembled the royal wedding party. The drinks at Trade were strong but the crowd was slim. The music was too loud so we decided to head to Boystown, the infamous male stripper bar that I think always reeks of desperation. The others had ubered to Trade so they hopped in my car for the short ride to Boyztown. Garrett bought a round of drinks for the guys but I stayed with water. True to form, the young strippers started circling like buzzards over a carcass in the Sonoran desert. It came as no surprise that Garrett and Neil both knew several of the entertainers. Introductions were made and twenty dollar bills were being slipped into stylish briefs showing large bulges. Three of the dancers were undocumented guest in this country trying to navigate the immigration system, or so we were told. It’s nice to meet enterprising young men pursuing the allusive American dream. I was not surprised that Neil was hooking up with one stripper who clung to Neil like peanut butter to bread. Garrett had his sights set on another dancer who seemed to be the crowd favorite. Garrett wants to take the young man out for dinner. I almost laughed. Just skip the dinner and take him to bed and throw some money at him. Why pretend it’s a date. I wasn’t attracted to any of the strippers. I appreciate a man. While young men with toned bodies and visible abs are nice to look at, I’m attracted to a man who looks like a man. I couldn’t wait to get out of there. After about forty minutes, Mike and I left the other three at the bar. Mike ubered back to his empty mansion in his suburban village and I drove home, stopping for donuts. I wanted to end the night with a treat that wasn’t looking for a green card. Gibson frequently explores colonialism and the post-colonial mindset, reflecting on how American Indian experiences parallel other civil-rights movements. His work also around universal themes of love, community, strength, vulnerability, and survival. Through this exhibition, catalog, and related programming, visitors will be able to gain an enhanced understanding of Gibson’s distinctive and complex creative practice, as well as how it has evolved from series to series. It’s great to see the DAM promote a Native American artist since there is a significant Native American presence in the region. 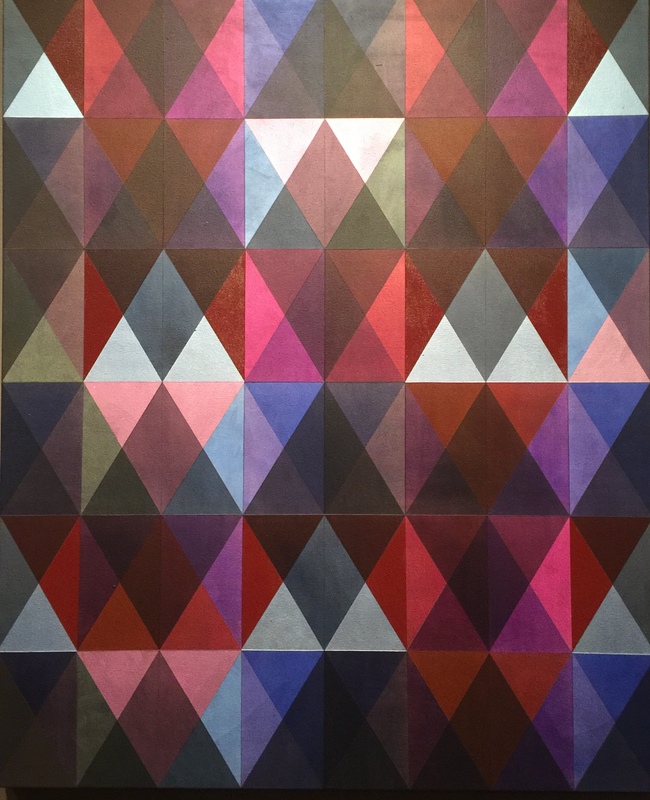 Jeffrey Gibson, All Things Big and Small, acrylic paint and graphite on canvas. 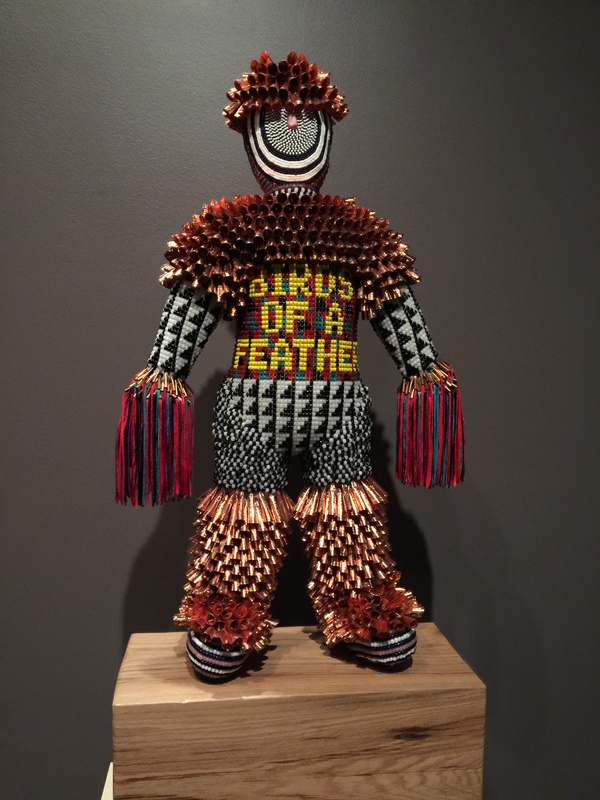 Jeffrey Gibson, Birds Of A Feather, glass beads, artificial sinew, wood, acrylic felt, druzy crystals, copper jingles, metal cones, nylon fringe and steel. 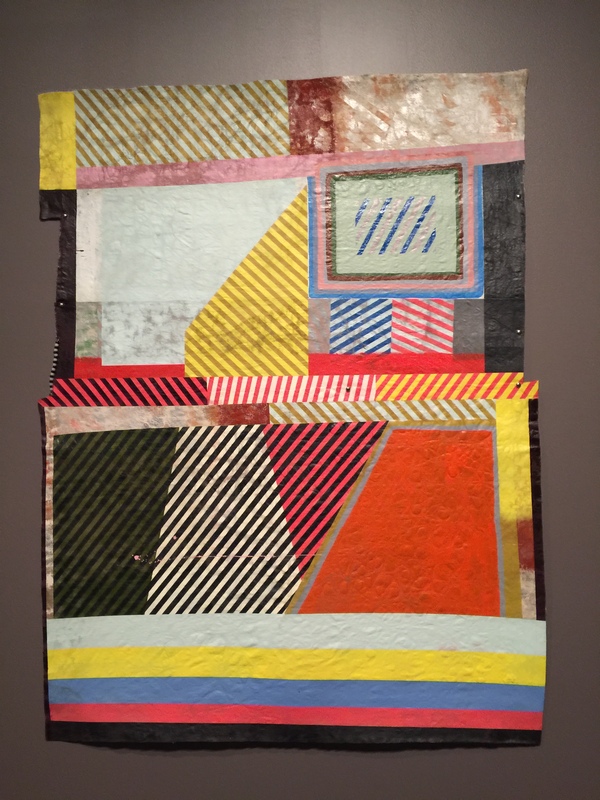 Jeffrey Gibson, Trade, acrylic paint on recycled and collaged painting, glass beads and steel studs. KL was there without the fiancé. Perry was there too. We did not speak. I will probably never speak to her again. I found out she’s been spreading vicious lies about me. Why do people have to be so cruel? I met KL years ago when he was fresh out of college and working with my ex. I never considered him a close friend, but he was a social acquaintance. I would see him at almost every charity fund raiser and party I attended. He seemed to have a knack for being photographed at events. His stunning good looks guaranteed he would show up in the photos published in the society columns of the local publications. He eventually started a small business which seemed to be successful. I would see KL at all of the Denver Art Museum (DAM) openings. He’s about ten years younger than me and has a thirty-something fiancé who is also a very striking man. Recently, the DAM mailed a glossy publication to members with updates on the $150 million renovation of the Gio Ponte building. The mailer included a list of significant donors. Imagine my surprise when KL was listed in the $50,000 and above category. I heard he was doing well, but having the financial resources to support a public cultural institution with a very notable donation, is a remarkable achievement for a man who came from humble beginnings. A local man does well and gives back to the community. KL’s charitable giving should shut up all the gossips who called him a social climber. I suspect they are jealous of his success. If social climbing results in financial success, which allows for a significant contribution to a premier cultural institution, I say get on the ladder. I had a coffee date yesterday afternoon. It turned out to be a disappointment drive but that’s partially my fault. I knew the guy was smoker but he told me he was cutting down and trying to quit. The first thing he asked after settling down at an outdoor table was if he could smoke. So much for cutting down. He was an interesting man but he needs to learn how to sell himself. In the first few minutes, I found out he had two heart attacks, has two ex-wives and a twenty-something son. He was engaging in conversation and interesting but he talked mostly about himself for the first hour, which didn’t win him any points. He had a fascinating career but now lives off two pension checks, one from the state and one from the federal government. He admitted he didn’t have a savings to fall back on. He left the door open for a second meeting for lunch or dinner but there’s no spark. He could be an interesting friend.